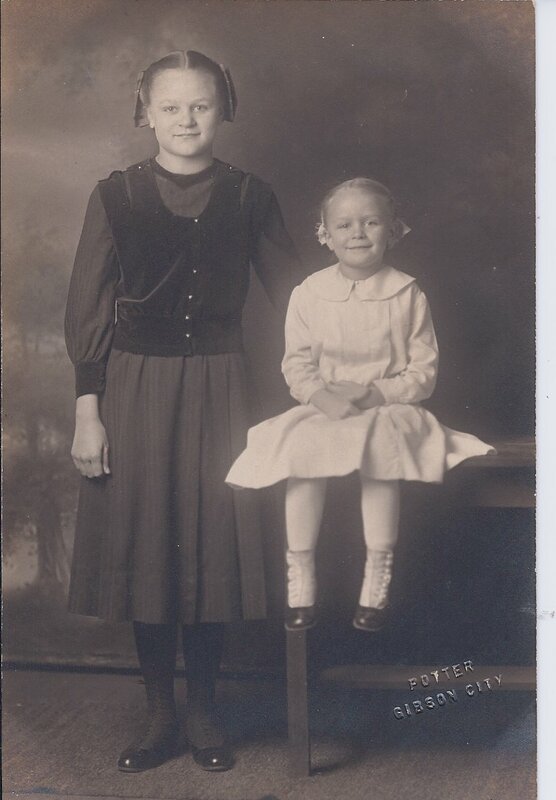 100 years ago today, my grandmother Mary “Louisa” Colvin Burns was born. In many ways I knew her well. I knew she could balance a business man’s books, sew her own clothes and crotchet an afghan. I knew she played the organ and occasionally sang at church. I knew she was the Secretary for the Business and Professional Women’s Association and raised funds every year by selling bags of pecans. I knew she put on her stockings during the week to go to work and wore her elastic-waisted jeans on the weekend to tend her garden. I knew she loved chocolate and bread and believed having a bowl of ice cream just before going to bed ended the day on a high note. I knew a little bit about her history, the time before I was born. She was from Illinois and had attended business school. Her Uncle Joe Colvin introduced her to my grandfather Ralph Burns during a summer visit to Colorado. I knew they got married September 1, 1929. But other than that she rarely spoke of the past. She never mentioned that two months after they married, the stock market crashed. It was her sister, who told me how my grandmother learned to cook dandelion soup when they ran out of cash during the Great Depression. The 1930s, aka the Dust Bowl years, were described as the years they spent ranching in eastern Colorado. Perhaps it was after her eldest son Earnest died during the great polio epidemic of 1946 that my grandmother quit bringing up what could not be changed. Instead, she tried to stay in the present, stay positive and work hard at making something of herself. Because she rarely spoke about the past and her beloved family “from Kentucky”, I knew nothing about her grand-cestors. I never knew our earliest known English ancestor appeared to be a young apprentice named Thomas Wright who arrived in Massachusetts in 1639. I never heard of Peter Jett who immigrated to the colonies from London in 1663. With a bit of stealth, he obtained a 600-acre land grant from Governor Berkeley in OLD Rappahannock County, Virginia. In the end it was an unfortunate acquisition because thirteen years later, in 1676, his wife, Mary Triplett, and three children were killed in a Susquehannock Indian raid. I never knew her ancestors eventually sided against the English monarchy and her great-great-great-grandfathers Henry Colvin, George Mains and Edward Hamilton were all young privates in the American Revolution. I never knew that after Daniel Boone cleared the trail into Kentucky, her family moved west to Bracken County. Eight generations later, the Colvins, Mains, Jetts, Wrights, along with the Scot-Irish McKinneys, Forsythes and Hamiltons still reside in the area around Pendleton County, Kentucky. There was so much family history I was unaware of. And in the end, maybe none of that history matters. Maybe all that matters is that in her time I knew she loved me. And unlike historical facts, I never have to re-search the memory of her love. It sits within me, eternal. I would like to comment “Retreating into Rumi”, but it cannot be found in your archive anymore! It is a beautiful and deep thought. It give a meaning to our solitary life and, indeed so much energy to accomplish our mission on earth. For a strange reason yesterday that post was SENT when I tried to SAVE. So you are welcome to comment today. Thanks I too thought it was a beautiful quote. Yes, Happy Birthday Grandma! It is nice to remember her positive spirit and honest, calm, diligent work ethic. One detail though, for your post, the elder son was named Earnest,no? Earnest Aaron, maybe. Thank you for remembering her life and history. We really enjoyed reading your blog! Dad said to tell you guys that Ernest’s middle name is the initial A. – just as Dad’s is R. – no names, only initials. For direct delivery, enter your email in the beige box below. Then click FOLLOW THE TALES. An email will be sent to confirm your choice. Thank you my friend. The Des Moines River is high and flowing fast now. Last month this area was flooded and the park was closed. A giant piece of ice was still melting along the edge. During the flood, the River was ten feet higher and filled with ice. The flood’s evidence was all around the area. When it flooded the banks where we stood today were covered in mud and water.